Tomita. Soundtrack to my new walk to the office each morning. Michael Jackson briefcase, spotted by Bernard Gavilan. I've just finished reading 'Born Standing Up' by Steve Martin, according to Seinfeld one of the 'best books about comedy ever written'. I was not disappointed. 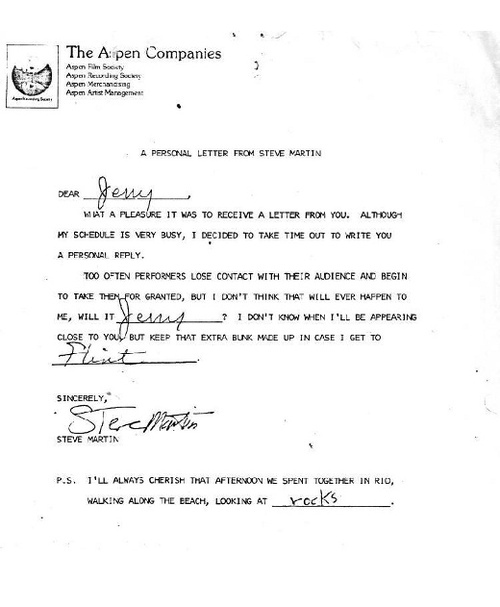 This is a standard personal fan letter from Mr. Martin. Yeah. It is. It really is. Let's finish this thing off with a switchblade-appropriate song.